OlyBet Poker Series brings together the best poker experience that OlyBet and Olympic Casino can offer. The monthly live-tournament series has been running already four years now in the Olympic-Casino’s casinos in Tallinn. The buy-in is €110 in all of the cities but you can get to the live tournament a lot cheaper via OlyBet online satellites. Get to the live-tournaments for a fraction of the price via OlyBet Online satellites! From Monday to Saturday at 18:00 there is Daily Freeroll Satellite tournament, where TOP 5 qualify for 20:00 Daily Satellite tournament. As the prizes are awarded in tournament tickets, all players have 90 days to choose the most suitable time for using the ticket. Freeroll Satellite starting stack is 500 points and 1 raked hand within 24 hours before tournament start gives additional 100 points to starting stack. From Monday to Saturday at 20:00 there is €3.30 Freezeout Daily Satellite tournament. TOP 5 of the tournament are guaranteed to qualify for Super Satellite, held every Wednesday and Sunday. As the prizes are awarded in tournament tickets, all players have 6 moths to select the suitable time for using the ticket. Daily Satellite starting stack is 2000 points and 50 raked hands within 24 hours before tournament start gives additional 1000 points to starting stack. Every Wednesday and Sunday at 20:00 there is €22 Freezeout Super Satellite tournament. Wednesday the TOP2 and Sunday TOP5 of the tournament are guaranteed to qualify for OlyBet Poker Series Live, held once per month in Olympic Casino flagship casinos in Tallinn, Tartu and Pärnu. As the prizes are awarded in tournament tickets, all players have 12 months to select the suitable time for using the ticket. Every winner is free to choose when and which Olympic Casino he/she is willing to use the ticket. Super Satellite starting stack is 3000 points to allow the best players to become winners. Live events registration in poker software ends 5 hours before tournament start. All players who have registered to live events from poker software must pick up their tournament ticket from casino cashier desk before the tournament start and by presenting valid ID. €110 OlyBet Poker Series Live ticket to tournament winner. 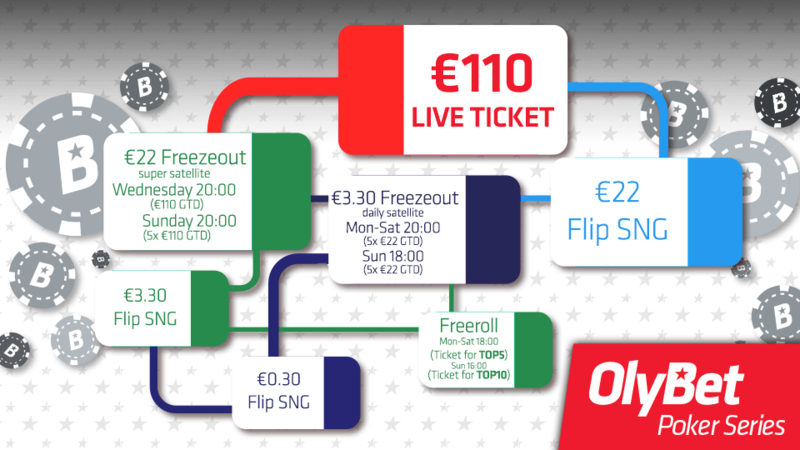 €22 OlyBet Poker Series Super Satellite ticket to each player who reaches places 2nd til 10th. €22 OlyBet Poker Series Super Satellite ticket to each player who reaches places 2nd til 6th. The added prizes are awarded to the players who have created and validated OlyBet Poker account by the time of playing out the tournament winner. It is possible to register OlyBet Poker account from dedicated computer inside casino. Registration is complete once the player has logged in to poker and selected poker nickname (alias) in poker software. The tournament tickets are personal and cannot be sold or exchanged to money. The tournament tickets are valid for 100 days. We wish you best of luck in the satellites and joyful live tournaments!